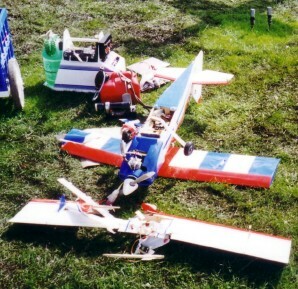 My interest in the Ultimate began with flying RC models. But I'm reluctant to start a page on this topic because it is so huge. 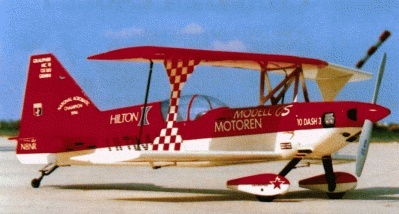 The Ultimate must be the best-selling RC biplane ever. In the hands of a good pilot, they fly as well as they look. Some of the rest of us have trouble dodging the trees. One afternoon at our field, there were nothing but Ultimates: two Carl Goldbergs, one Great Planes, and a Sig Bluehawk. 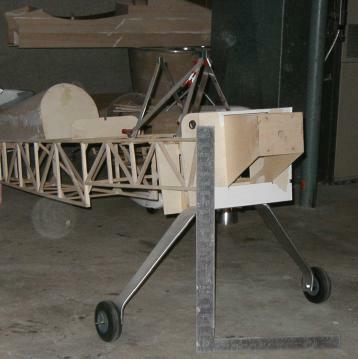 Bob White of Innovative Wings in Calgary, Alberta, is building a 50% model of the Ultimate. Here is the whole story. Chip Hyde's 1999-2000 Tournament of Champions Ultimate. 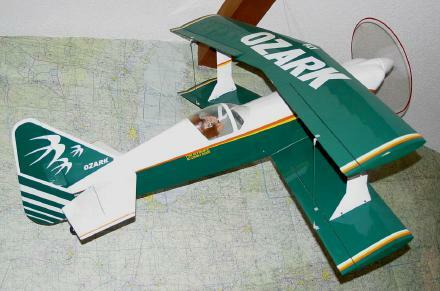 Barnstormer Model Products 1/4 scale kit. Notes on the original Barnstormer 10-300S. As I mentioned before I am building my own model of Ultimate, so I figured it might be interesting for you to see the final result. It isn't finished yet, but this is the color scheme I am going to use; to be exact I plan to color it in exact the same way, I even intend to put some effort into the side banners. Hope you like it! The kit is from Sebino, an Italian company. It is said, that it is suposed to be the best Italian kit on the market, which I can only confirm. 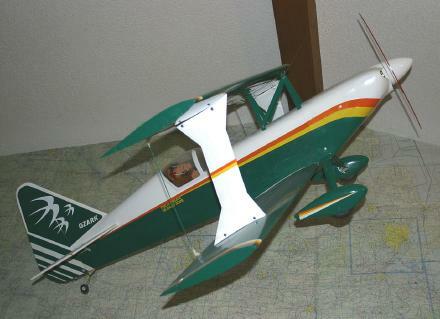 The kit is full scale, very quality made, with glas fiber fuselage which is strengthened with carbon in the front; the wings are styro-abachi and the main upper wing supporter is from duraluminium......all together a very good product. About the color scheme...it is really beautiful; the side banners are going to be tricky though (I don't like stickers), but they give the final superb touch to the finish!